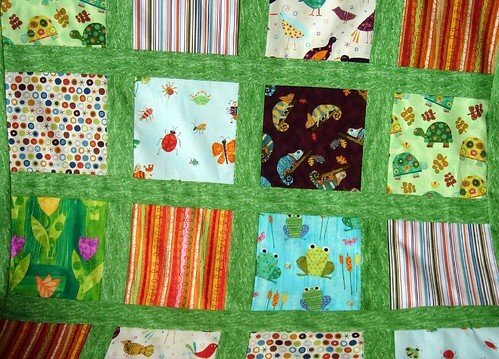 More Amy Schimler Creatures and Critters ... with a few other fabrics mixed in. 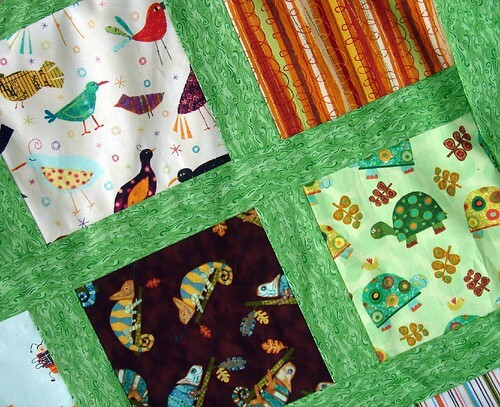 The sashing, while I love it, is a little more predictable than the last quilt. It is really nice and bright though ... very cheery. 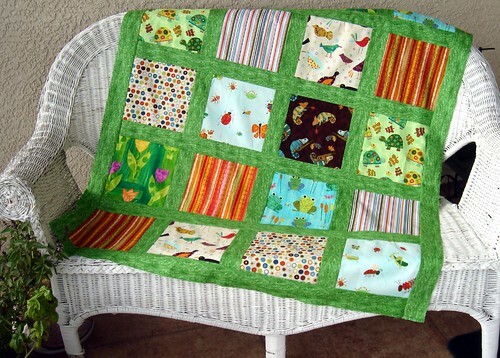 I can just imagine a little one enjoying some tummy time on the quilt with the animals and critters to talk to and play with. The squares are again 8" and the sashing was 2.5". No border on this one ... it seems complete enough as it is (I could change my mind there though). It's a super quick top to put together ... I almost felt guilty because it was so fast (maybe two hours from start to finish). Ok- I am cracking up over here. My first thought when viewing these photos was, "oh-I like the green fabric so much better so-" & I read..."much more predictable..." & think, I didn't even finish my thought and I was called predictable!